Home to the world’s tallest building, Dubai is a city built upon the concept of bigger being better. On the surface, everything is shiny, cutting edge, and meant to show that Dubai is progressive. At the same time, the culture is very much steeped in tradition. When it comes to food, the marriage of this nouveau, extravagant ideation with the city’s culturally rich backdrop is a winning one. The combination of Dubai’s centuries-old recipes and food preparation techniques with access to the freshest and highest-quality ingredients results in extraordinary cuisine. The newly constructed Dubai Waterfront Market is an example of the traditional and the modern synchronizing perfectly. The market, massive and bright, is packed with high quality and mostly local foods. 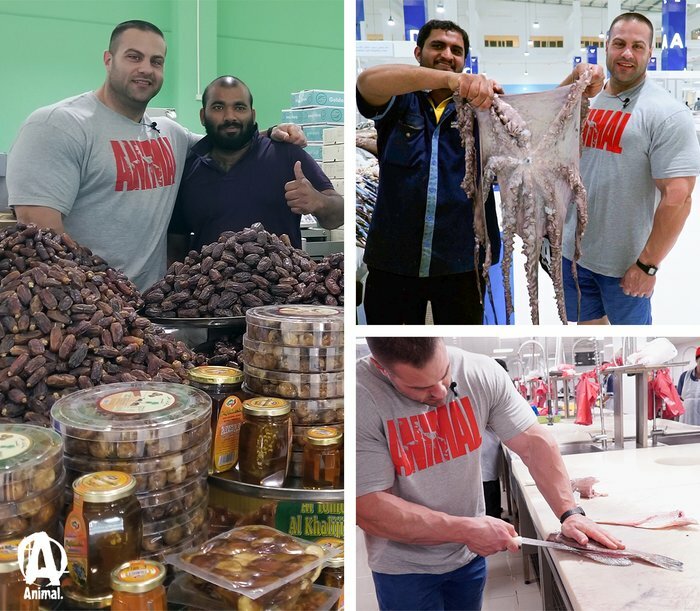 Much of its seafood selection was pulled from Dubai’s nearby waters only a day before coming to market. The access to local food is a culinary win. One of the many helpful fishmongers directed me to an area where my purchase was cleaned and fileted to my liking. Afterward, I crossed to one of the many restaurants at the rear of the market to have my retail “catch” freshly prepared. In addition to the market’s extensive variety of fish, there are wonderful areas dedicated to meat, poultry, produce, and dried goods and spices. I found myself staring at more than 50 varieties of dates from all over the Arab world. I left with 10 pounds of them—a new addiction that is terribly frustrating to feed back home, since nothing remotely similar exists in the United States. 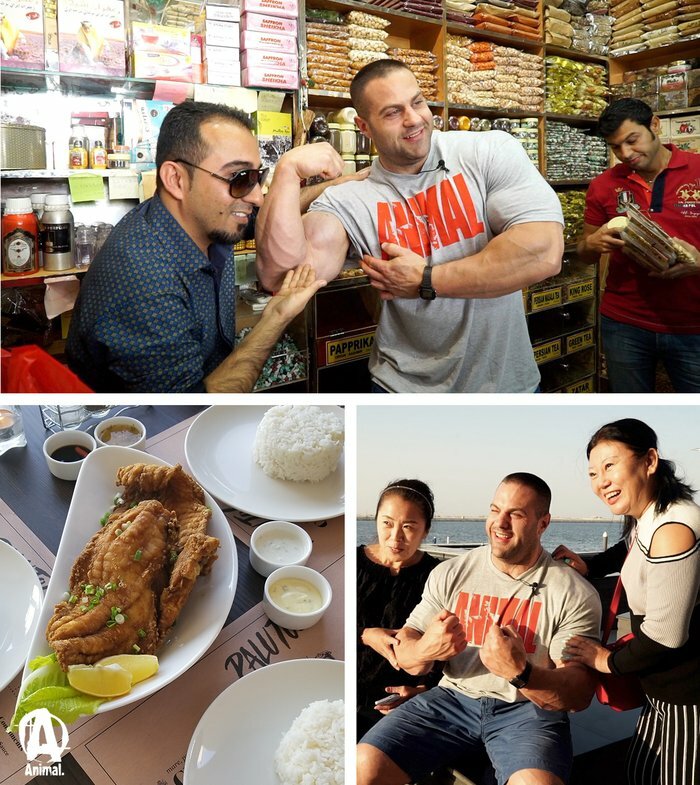 In general, the food in Dubai is as close to being perfect for a bodybuilder as I’ve ever seen. There is plenty of protein everywhere. Lamb and seafood are abundant. And the foods are prepared with a liberal use of digestion-friendly spices, which allowed me to easily eat very large quantities without any discomfort. Additionally impressive was the variety and unique preparation of vegetable-based salads. And, of course, in the Middle East rice is everywhere, and it’s steamed to perfection. Pairing proteins with great vegetable sides and clean, simple carbs made me feel as though I could eat almost nonstop without repercussion. Even my hotel featured great food. I was amazed by the spread offered each night for dinner: braised lamb falling off the bone, chicken livers, fresh fish, steamed rice, and a seemingly endless variety of freshly prepared vegetable salads. When I asked the hotel manager to have a list of food prepared and delivered to my room each morning, he responded: “This is no problem. Let me get the chef. Tell him what you want him to make.” How’s that for accommodating? I have never before eaten so much clean, high-quality, high-protein food while traveling, and still felt so good.